Shallow fry soya bean mini chunks in 2 tsp oil for a few minutes and then soak them in warm water for 15 minutes. Squeeze excess water from the soya bean chunks and keep aside. Heat the remaining oil in a pan, add cumin seeds. After they crackle,add chopped onion and saute till the onion becomes tender. Add ginger garlic paste,green chilies and stir for another 2 minutes. Add chopped tomatoes,red chili powder,turmeric powder,coriander powder,garam masala powder,salt and fry for a minute. 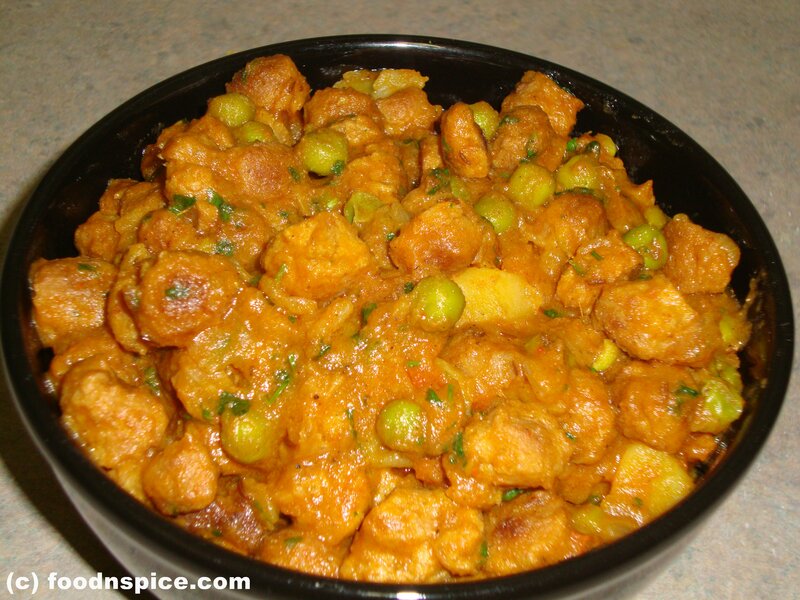 Add soya bean mini chunks, peas and potatoes.Add enough water to cook the potatoes and peas. Cover and cook till the potatoes are cooked and the peas are tender. Cook till it is almost dry.Garnish with chopped cilantro and serve hot with Chapati, Roti or Naan.